You see... really, it's not my fault. This is how it is here. This is my life... barns and cows... cows and barns... and hay and tractors... and cows... and work and clotheslines and dogs... and cows... and barns. Did I mention cows? I wouldn't want to forget them, cuz they are everywhere around here. So, ya see, my friends, you can't really fault me for my excessive cattle obsession posting of farm scenes. I just take photos of what's around me. Hey - that's my story and I'm stickin' to it! I won't mootiny over this. You keep on farming. The skies can take care of the themselves. Never mind, Misty. We love cows too. This is a great photo. Nice shot! Nothing wrong with cows. We see a lot of them here, too. :) People must think I'm obsessed with elk from all the photos of them I post. Cows are nice critters anyway, great shot Misty. Peaceful shot from the countryside. 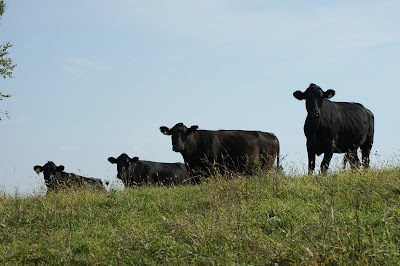 Like many of your other visitors, I enjoy the Sky Shots featuring ‘country scenes’ … even cows like these. I love it!!! Not only is the sky beautiful, but so are the cows! Hi we found your blog through Technorati, thought we'd stop by to say hey! It's a great shot with the cows under the sky! Love your animals! Hey don't apologize for your milky four legged friends, they're watching the sky, aren't they? Well, more like you coming with an arm full of a little something for elevenses. Wish we had as much growth on our partures or some hay for the tractor to shift. Drought is not much fun for beast or farmer. I loke your friendly skywatch pic.. I would like to live in a farm, the cows are so calm as well as they transmit calm. Well moo-hoo! I like cows, but not when they break through the neighbors fence and invade my yard...ah, those were the days of living outside the city!